Erin started working in the Power Supply Department at the Marietta office as an Associate Engineer in May 2009. 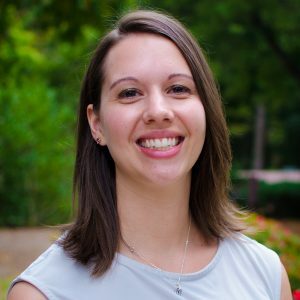 She had just graduated as an Industrial Engineer from Georgia Tech, and GDS was her first full-time job. While at Georgia Tech, Erin worked on supply chain analytics at Coca-Cola Enterprises for 4 semesters as part of the cooperative program. She gained priceless knowledge about working in the real world and learned how to apply her Georgia Tech studies to real-life applications. Erin graduated from Georgia Tech in May 2009 with a Bachelor of Science degree in Industrial Engineering. Many of her projects focus on customized power supply portfolio planning for clients in PJM & MISO based on their risk profiles & preferences. This may include conducting RFPs (Request for Proposals) to serve their short-term & long-term energy & capacity needs, reviewing various resource opportunities (in front of the meter & behind the meter), and developing short-term & long-term wholesale power supply financial projections. Erin has also helped with several EEI contract negotiations, which are standardized power contracts that can be used for multiple power transactions in lieu of negotiating a new contract every time. Over the past 10 years, I’ve grown and learned a lot, both personally and professionally, at GDS. Overall, I enjoy continually learning about the evolving power supply industry and all the factors, regulations, etc. that may impact or change it. It requires me to always be thinking outside the box and anticipating what’s next. I have also been fortunate to develop relationships with many of our reoccurring clients, who provide some great opportunities for new, exciting projects and show appreciation and understanding for us and our work. On my day off, I enjoy going for a run or hike, reading a good book, or cooking something tasty. Where is your favorite to travel? My favorite place to travel nearby is Asheville, NC. It’s a relatively short drive to a very walkable city with great food and hikes. I love to travel anywhere with my husband and explore places off the beaten path. It always leads to a good story. Are you interested in any sports or extra-curricular activities? Life is crazy with 2 small kids at home, so going for a good run is my outlet. To keep myself motivated, I usually have a race on the calendar. Next one up: Las Vegas Half Marathon! I have a loving husband, Drew, and 2 children–Emma (4 years) and Fin (2 years). They all keep me on my toes!